My favorite theme to a Thanksgiving meal is tradition. Not what is traditional to others maybe, but the foods I had the pleasure of enjoying throughout my childhood. Mashed potatoes, green bean casserole, homemade cranberry sauce, gravy, stuffing, and of course the turkey. This turkey you see here is 15-16 pounds and took 3 hours to cook. 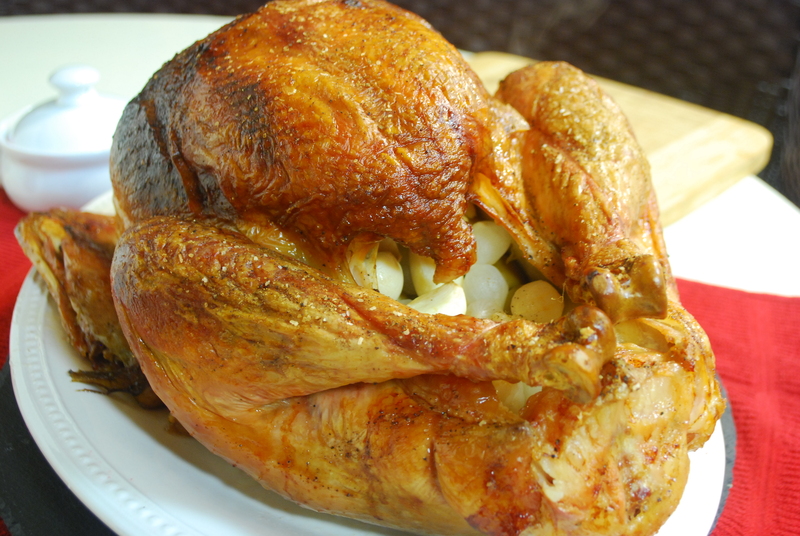 A killer trick to not running out of oven space on Thanksgiving, is to barbecue your turkey. Ta-dah! Your dilemma of how to fit all of the side dishes in the oven has, at least, diminished. First step in prepping the turkey is to remove the neck and giblets from the bird’s cavity, then stick it in a food grade bucket or large pot to brine for 10-12 hours, depending on size. Heat these ingredients, then allow to chill before adding the turkey, refrigerate. To prepare your grill station, heat the grill to 325F. Remove the turkey from its brining solution and pat dry, stuff with Green olives, pickled garlic, and cocktail onions (don’t stuff too full, you want some airflow). To ensure maximum moisture in the breasts, truss with kitchen twine, seasoning with salt and pepper as you go. Place on a rack in a roasting pan, breast side up with 1 inch of water and herbs; I used rosemary, sage, and a bay leaf. Once you’ve got the turkey trussed and cooking happily on the que, prepare your smoking materials. 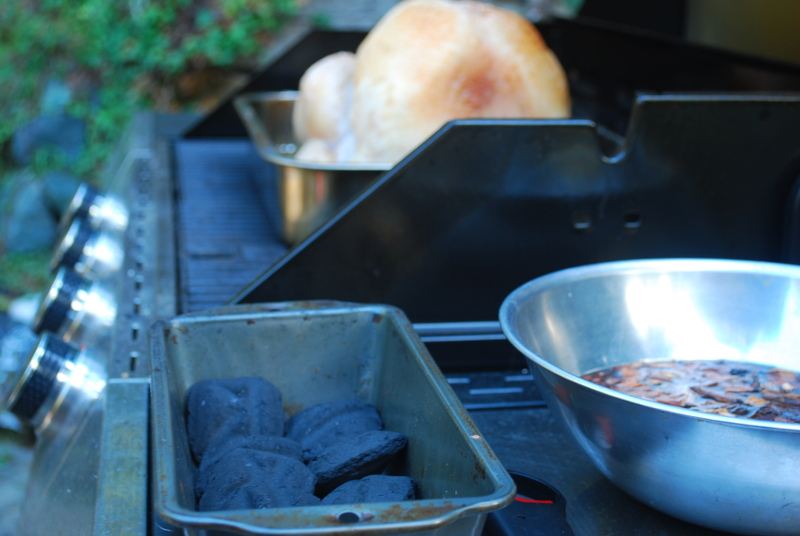 Place 8-10 briquettes in a metal loaf pan, or a few layers of aluminum foil. Soak a large handful of wood chips in a bowl of water; the smoke from any fruit wood will pair nicely. I prefer to smoke my meat in the last half hour or so of cooking. After 2 hours of roasting, adding water to the pan as needed, light your briquettes, place on the grill, and add wood chips once they are nice and ashy. Remove the bird when the internal temperature of the breast is between 160-165F. 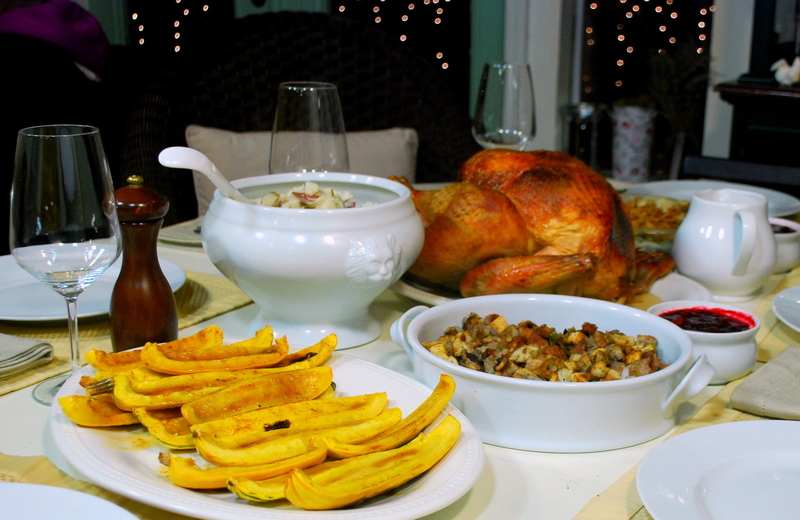 Allow to rest for 30 minutes before carving or you will lose all of those juices you worked so hard to keep. Enjoy this, and I hope you are looking forward to the rest of the components that make up my traditional Thanksgiving feast.